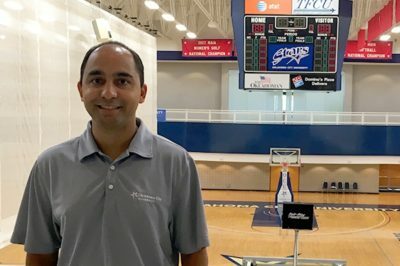 Vinay works with 15 members of the men’s basketball team, both coaching them and monitoring them academically to help them be successful overall. Vinay coached for 10 years as an assistant, starting as a graduate student at West Texas A&M University, followed by a year at Rogers State University in Claremore. He has bachelor’s and master’s degrees in exercise and sport science from Texas Tech and West Texas A&M. Vinay enjoys working with students at a time in their lives when they’re figuring out who they want to be. The basketball staff has worked really hard at creating individual relationships with players, he said. The better the relationships are, the more they can positively affect the players. What do you tell your players every day? Do you have favorite moments as a coach? “I would say yes, but we’ve won 15 games at the buzzer in two years. Those have been great. I’ve had a lot here. Getting to see the guys walk the stage in May—I would say that’s been better than any game that we’ve won because of how much that’s going to affect them down the road. Vinay and his wife, Megan Patel, OKCU’s assistant women’s basketball coach, are from small towns in West Texas. They’re enjoying living in a major city for the first time, where they have the opportunity to do as much — play Top Golf and try new restaurants — or as little — stay home with their two dogs — as they want.